There were already some rumours but now it is officially announced, OMA will build the new headquarters for the big Chinese television co-operation CCTV in Beijing. 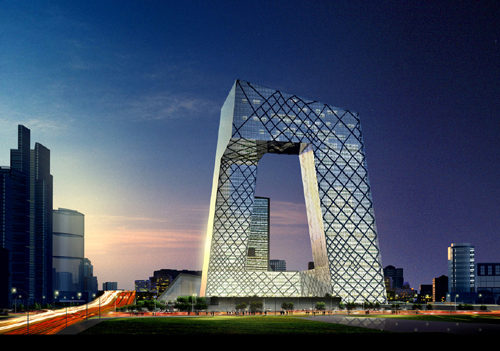 CCTV's new 550,000 m2 headquarters will be completed for the Beijing Olympics in 2008. The total construction cost is estimated at 600 million euro. The CCTV headquarters will be one of the first European skyscrapers to be built in China. Out of ten competitors Toyo Ito, East China Architecture & Design Institute and OMA where selected for the second phase. A jury that included architect Arata Isozaki and critic Charles Jencks selected the OMA design. The headquarter will be built on a 10-hectare site in the new Central Business District in Beijing. The proposal consists of two high-rise buildings: The first one is 230m high with a floor area of about 400,000m2 and combines administration with news, broadcasting, studios and program production. The building is not a traditional tower, but a continuous loop of horizontal and vertical sections that establish an urban site rather than point to the sky. The irregular grid on the building's facades is an expression of the forces travelling throughout its structure. The second building, the 115,000 m2 Television Cultural Center (TVCC) is visible from the main intersection of the Central Business District through the 'window' of the CCTV headquarters. It includes a hotel, a visitor's centre, a large public theatre and exhibition spaces. OMA just released a beta version of their website. Archined is working with OMA to catch al the bugs.